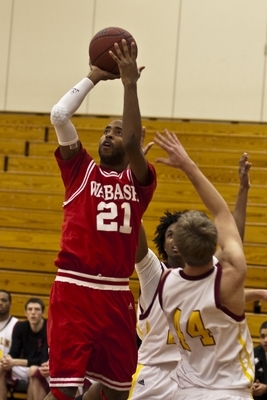 Wabash earned its seventh consecutive victory with a 77-55 win at Oberlin Saturday afternoon. The Little Giants shot over 50 percent from the field behind the 28-point, 10-rebound effort of junior Wes Smith. Saturday’s win, combined with a 66-56 loss by Wittenberg to Wooster, gives Wabash sole possession of second place in the current North Coast Athletic Conference standings. For photos from the game, click here and here. Smith (right) was 11-of-15 from the field, including 2-of-3 from three-point range. He added three steals, three blocks, and two assists along with his 10 rebounds to record his third double-double of the season. A 7-0 run at the nine-minute mark boosted the Little Giants’ lead to double figures. Wabash eventually took a 43-32 lead to the locker room at halftime before doubling the advantage in the second half. Oberlin took advantage of several Wabash turnovers in the first half, scoring 11 points off of seven miscues. Smith and Ben Burkett scored the first five points of the final period to put Wabash up 16. Oberlin made a final run, eventually cutting the lead to eight points with eight minutes left to play. Andrew Gilman ended the threat with a three-pointer to push the Little Giants in front 60-50, starting a 14-4 run for Wabash over the next six minutes to put the game away. Senior Chase Haltom added 13 points, giving him 998 for his career heading into Wednesday night’s home game against Ohio Wesleyan. Burkett added 13 points, as well. Gilman’s three accounted for his only points of the game, but the junior guard handed out five assists in the victory. Josh Mettitt paced Oberlin (4-13, 0-8 NCAC) with 18 points. Andrew Fox and James Tompsett each added 16 points. The Little Giants return to action Wednesday night with a home game against Ohio Wesleyan (8-9, 5-3 NCAC).The Battling Bishops defeated 70-62 Saturday to record their fifth consecutive win. Wabash has won all seven of its home games this season and is perfect in its last eight appearances at Chadwick Court.